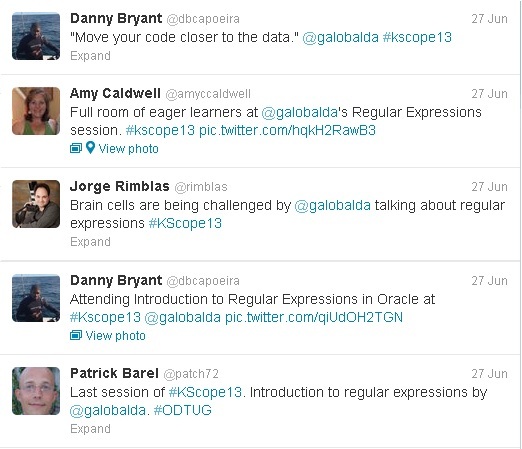 It has been a week since I returned from Kscope13 in New Orleans and just now I’ve found some time to write about it. This was my first visit to this city and I really enjoyed running errands to see historic locations and looking for places to try the amazing food they have. It was also nice to see again friends that I got to meet last year in San Antonio and to meet new ones like Amy Caldwell and Bobby Curtis. The conference had great content as usual and I really enjoyed the presentations that I attended. I came back with a nice list of things to test and see if they are a good fit for the applications I develop/manage. This year I had the privilege to present for the first time and it was a very positive experience. Surprisingly, my “Introduction to Regular Expressions in Oracle” session was very well attended and I had a good interaction with the audience. I wasn’t expecting too many people because of the day (Thursday, after a bigggg party the night before…) and the time (last session); but it was encouraging to see them trying to make the most out of the conference until the very end. 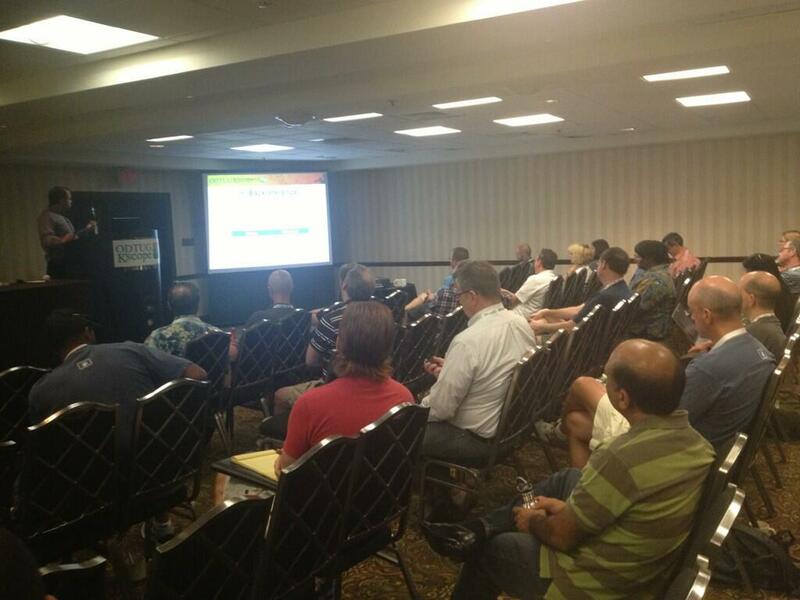 Some of the attendees were very kind to tweet about the presentation (thanks for the picture Amy Caldwell!). In the end I had a few interesting questions that I’m planning to turn into blog posts. Once again ODTUG and YCC did a great job to put together a wonderful event. I’m already looking forward to next year. 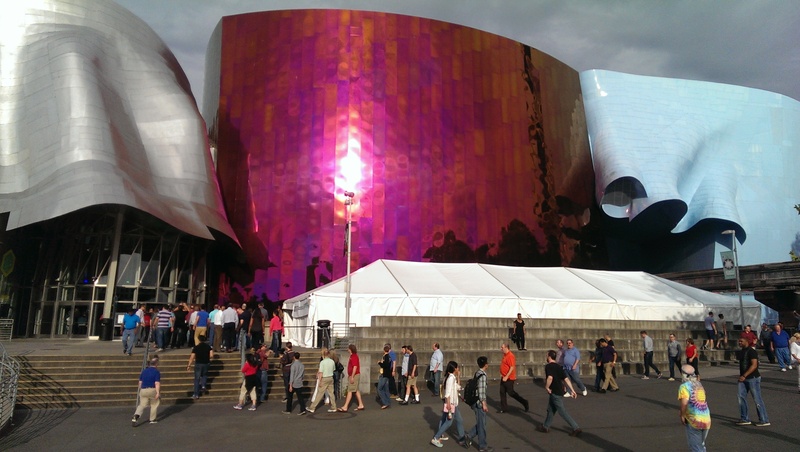 The registration and abstract submission for Kscope14 are open. Make sure you get to Seattle to be part of it! So you haven’t decided if you should go to Kscope13. I’ll give you 5 reasons why you should stop procrastinating and register right away! 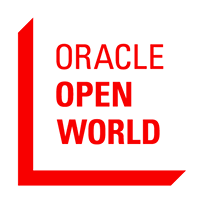 4½ days of great technical content for Oracle developers. Plenty of presentations and hands-on training on several areas such as APEX, BI, development tools, SQL, PL/SQL, etc… I guarantee you’ll wish you could clone yourself to attend several sessions at the same time. Are you the kind of Oracle enthusiast that is always reading books and blogs? If the answer is yes, let me tell that your favorite authors including Tom Kyte, Steven Feuerstein, Cary Millsap, Maria Colgan, Dominic Delmolino, Tim Gorman, etc… will be presenting at Kscope13. Most of them stay with you at the same hotel during the entire conference and they are very approachable people that you can meet and talk to. It’s a great opportunity to meet and network with fellow developers to learn about new stuff they’re working on. Maybe they already solved a problem you’re facing right now. I’m sure you’ll go back to the office with plenty of ideas/solutions for your own projects. You get to know the nice people that build and enhance the tools you love to use on a daily basis. You’ll have the opportunity to interact with Oracle product managers and developers that will answer your questions about their products. Last but not least, you get to visit beautiful New Orleans. I always wanted to travel to this historic city and never had a chance. Well, that’s about to change because now I have a great excuse to be there. ODTUG really puts a great effort in order to make Kscope not only the best technical conference for Oracle developers but probably one with the best social activities also. Last year I attended for the first time and I really enjoyed it so much that I submitted an abstract for this year and it got selected. I really hope you can attend and if you do, make sure to stop by my session in case you haven’t heard about regular expressions before. It’s been several days since Kscope 12 ended and what a conference we had! The User Group Oracle Development Tools (ODTUG) organized the best conference I have attended so far. Everything was impeccable, starting with the conference site (JW Marriott San Antonio), presenters, activities at the end of the day and of course the party at Knibbe Ranch with an incredible atmosphere, good music, drinks, games, Texas BBQ, and we even attended a rodeo! 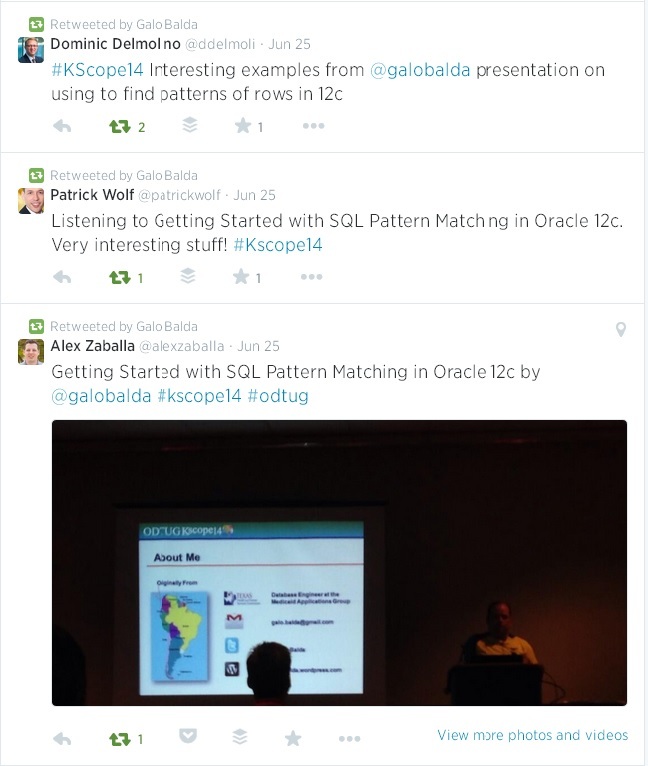 Kscope was a great experience and I recommend it to all those who use Oracle tools for application development. Not only the technical content is excellent but it gives you the opportunity to meet and often make friends with other members of the Oracle community. I finally got to meet a lot of “Oracle tweeps” that I’ve been exchanging messages with for some time like Jeff Smith (@thatjeffsmith), Chet Justice (@oraclenerd), Patrick Barel (@patch72), Dan McGhan (@dmcghan), Kellyn Pot’vin (@DBAKevlar), Tim Gorman (@timothyjgorman), Cary Millsap (@carymillsap), Dominic Delmolino (@ddelmoli), Alex Gorbachev (@alexgorbachev), Noel Portugal (@noelportugal), Christian Rokitta (@crokitta), Kris Rice (@krisrice), Dan Norris (@dannorris), James Murtagh (@allthingsoracle) among others. Single Table Access Paths by Jonathan Lewis. Optimizing a Two Table Join by Jonathan Lewis. Beating the Oracle Optimizer by Jonathan Lewis. Understanding Optimizer Statistics by Maria Colgan (@sqlmaria). Top Tips to get Optimal Execution Plans all the Time by Maria Colgan. Implementing MapReduce with SQL Algorithms and PL/SQL by Dominic Delmolino. Next year the conference will be held in New Orleans and the organizers promise to surpass the success of this year, and I bet they will. 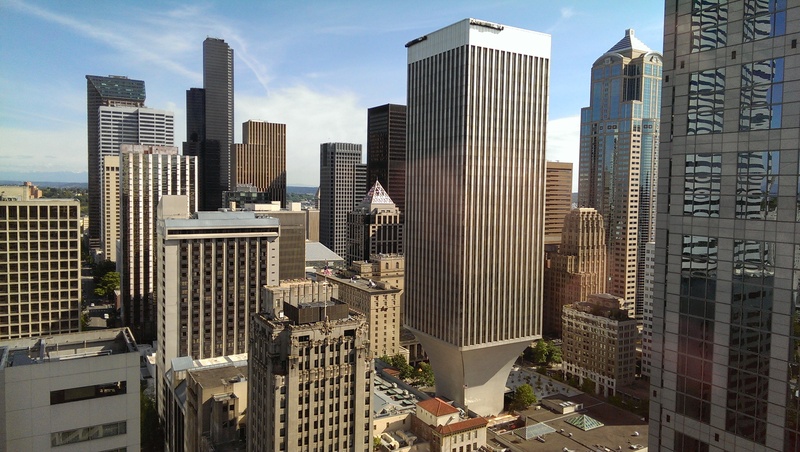 Registration is now open for Kscope 13, so do not think too much and sign up!